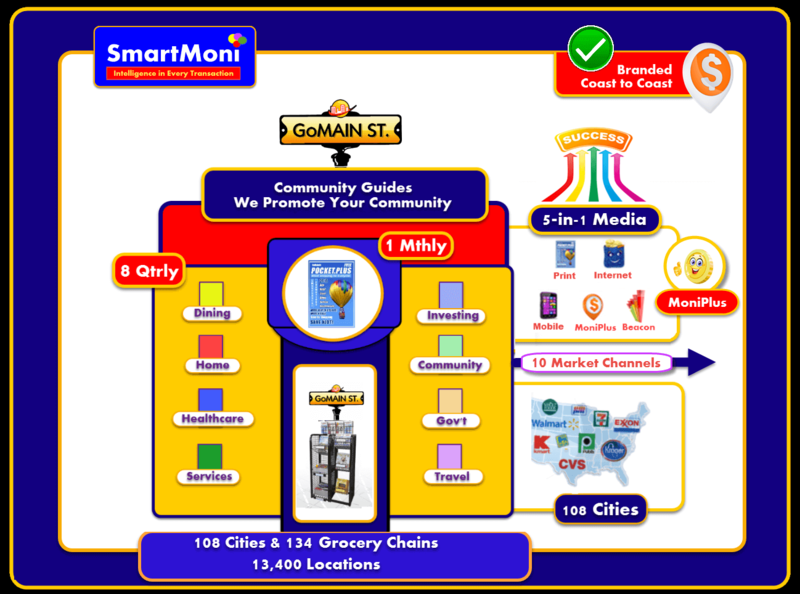 We become the Worlds Largest "Community Bank "
Print - 8 Million distributed FREE MTHLY in 108 Cities w/134 Grocery Chains at 13,400 locations. 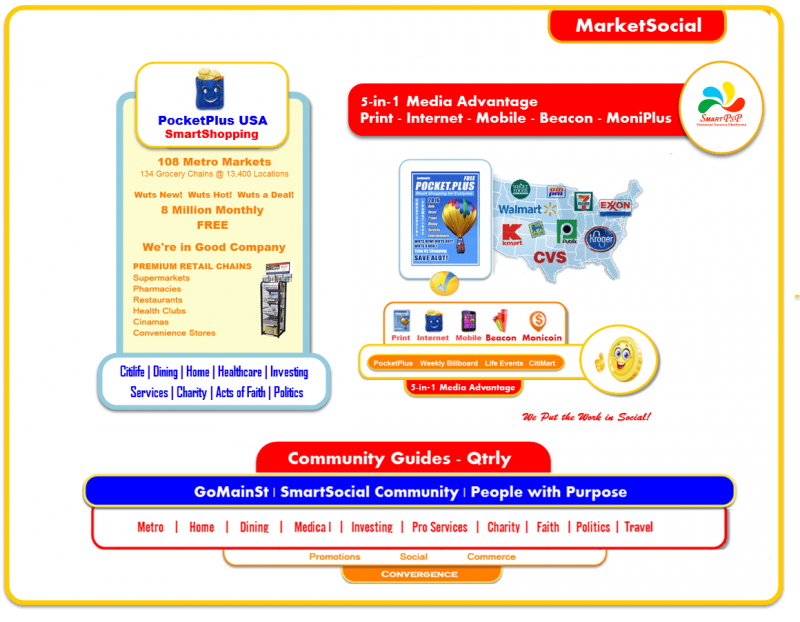 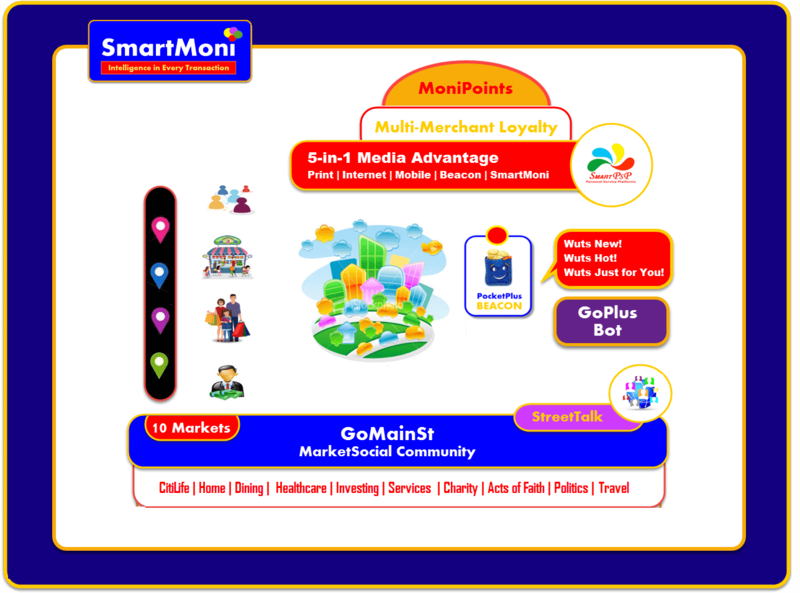 Also 8 Qtrly Community Guides for 8 Market Channels. 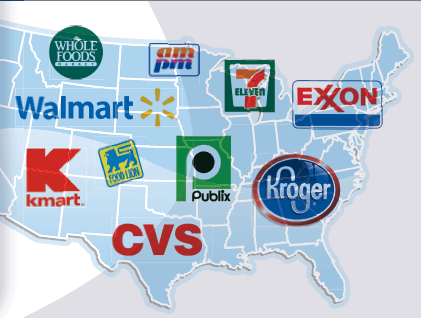 Loyalty is a Growth Business Enrollment in loyalty programs in the US grew by 20 percent to 3.32 billion in 2015 from 2.65 billion just 3 years earlier. 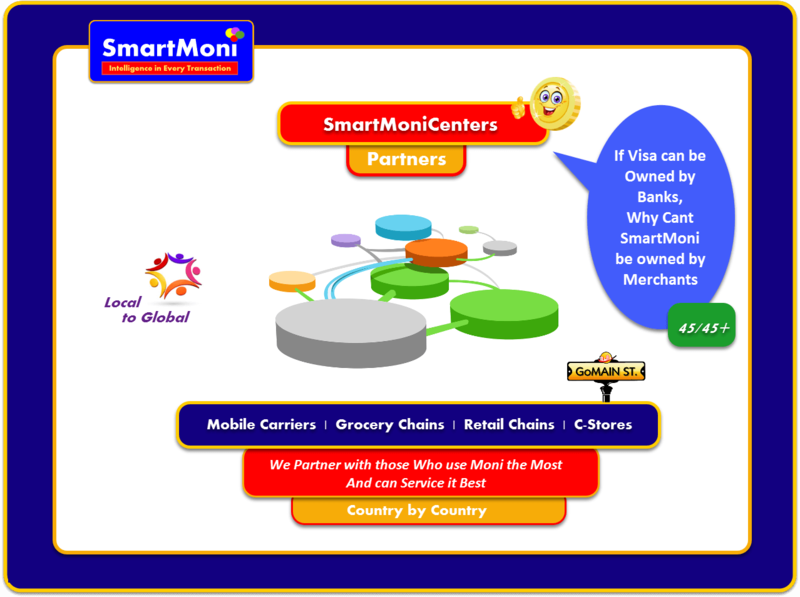 While Multi-Merchant Loyalty Programs are successful everywhere else. 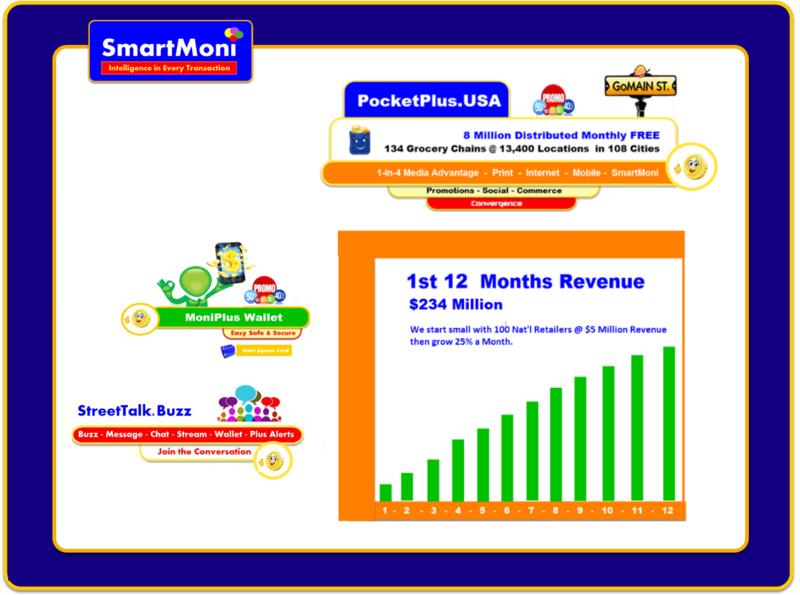 Until now, no one has ever initiated one in the US Market. 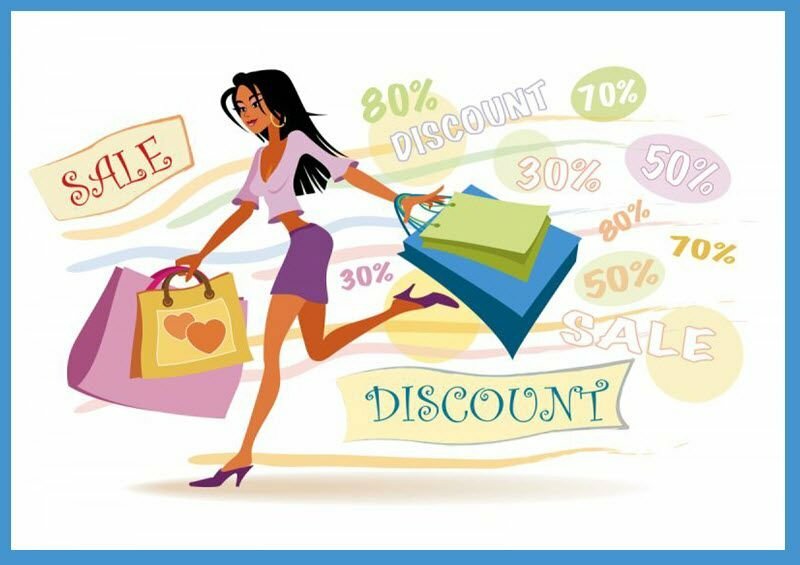 Multi-Merchant Programs typical cost 1% of Sales vs 1.5% for Private Loyalty. 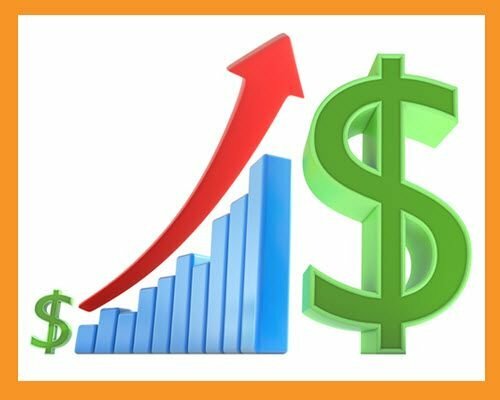 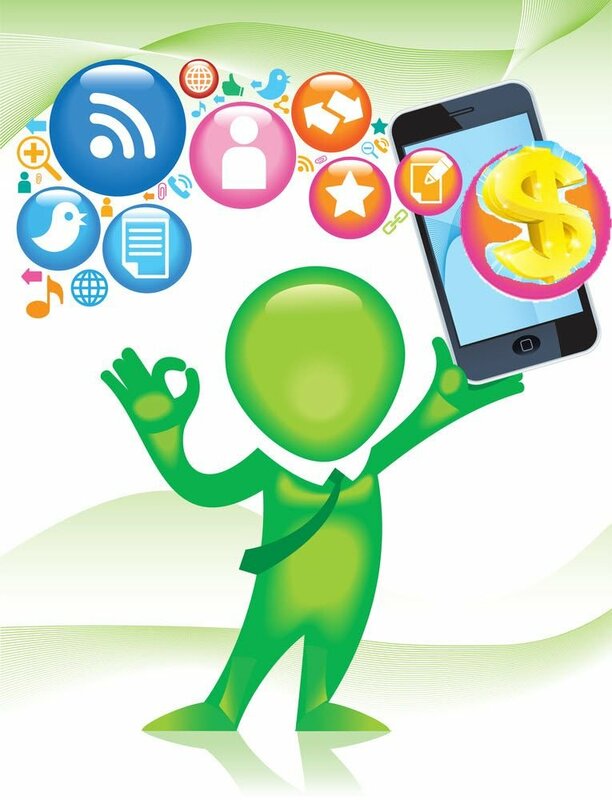 Program Goals are higher customer retention, lifting sales and shifting competitors customers. 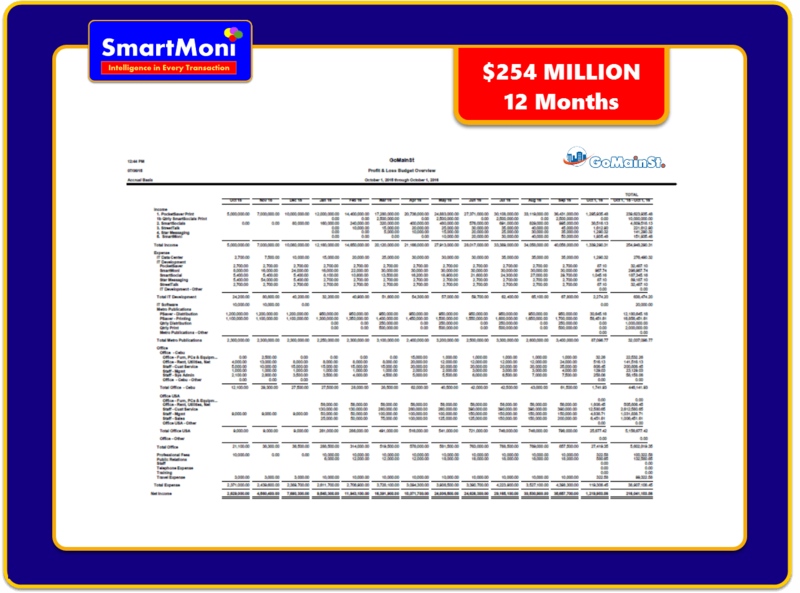 ROI Goal is typically a 15% increase of the 3 matrix's combined. 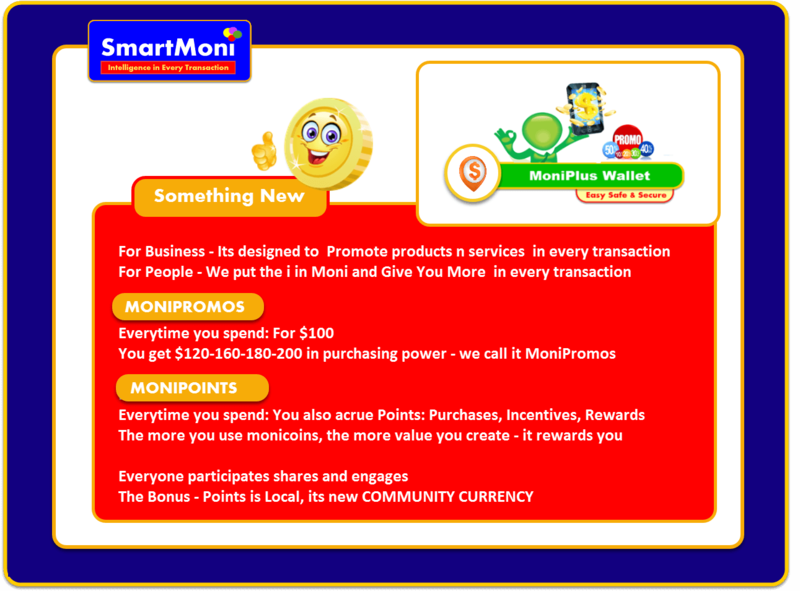 73% - Recommend brands 81% - Do business with brands 66% - Modify spending	75% - Brand relationship 70% - Modify when/where to buy 80% - Choose a Bank offers rewards Increased Purchasing Power Building Relationships Stronger Communities People Business & Communities"
Life is Better with Purchase Plus 2 Tech Platforms and 4 Branded Solutions. 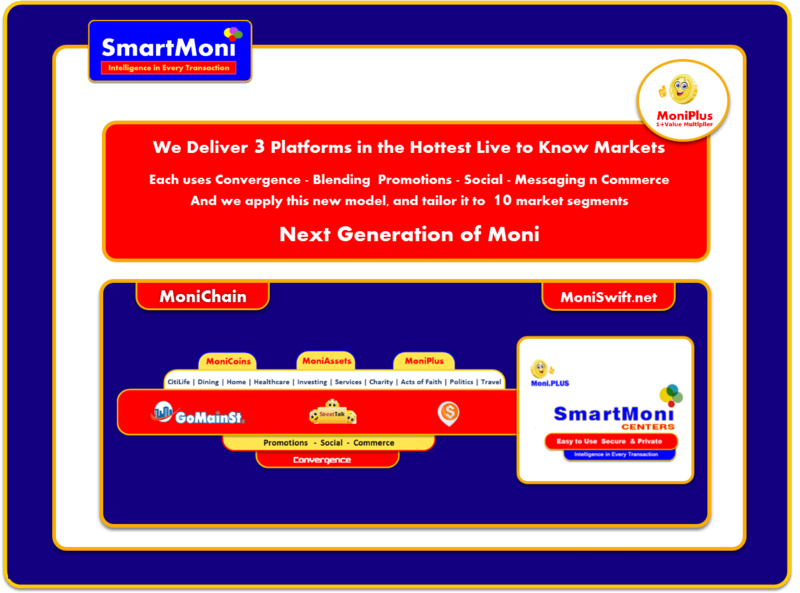 Strategic services on the fly & providing a Fully integrated seamless environment for whole markets to operate with Convergence: Promotions, Social, Commerce w/MoniPlus. 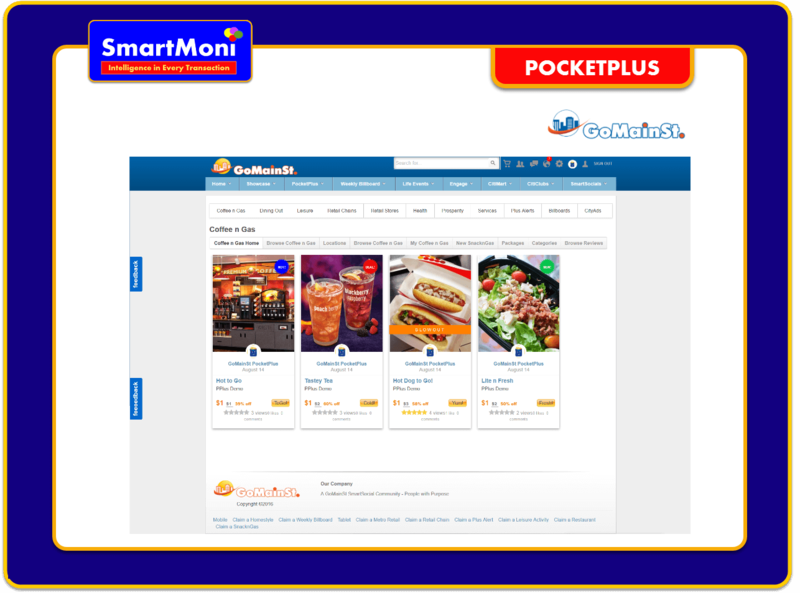 GoMainSt w/PocketPlus enables Merchants to deliver 5 types of Promotions across 5 Integrated Media for 11 Broad Market Segments coast to coast. 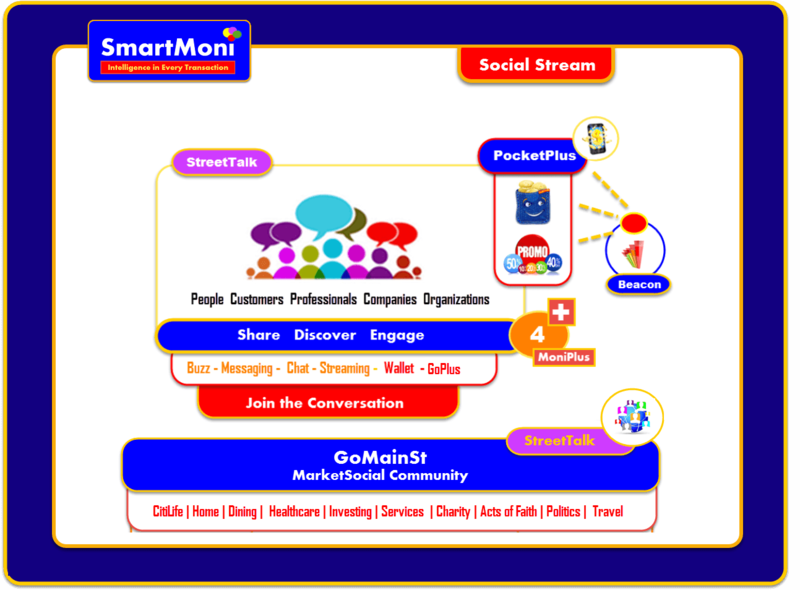 StreetTalk provides the SocialStream for Consumers, Professionals, Business & Organizations to engage and Join the Conversation. 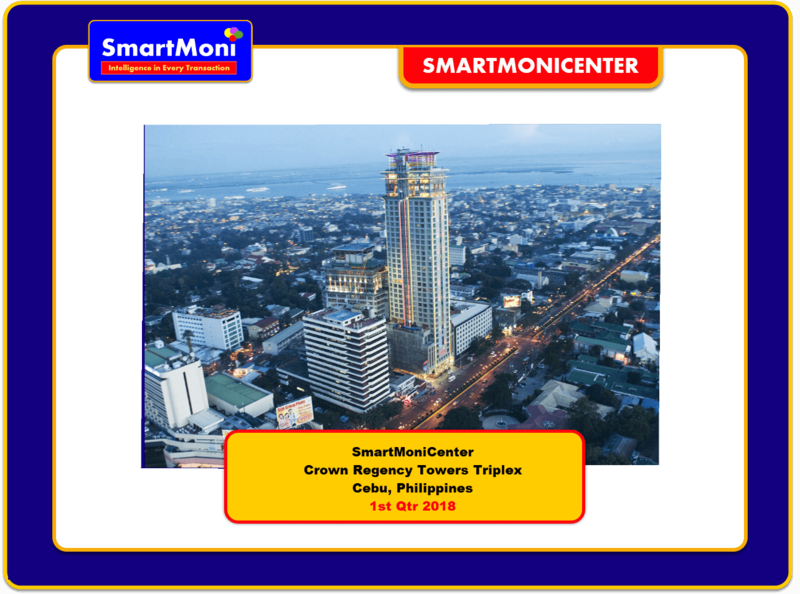 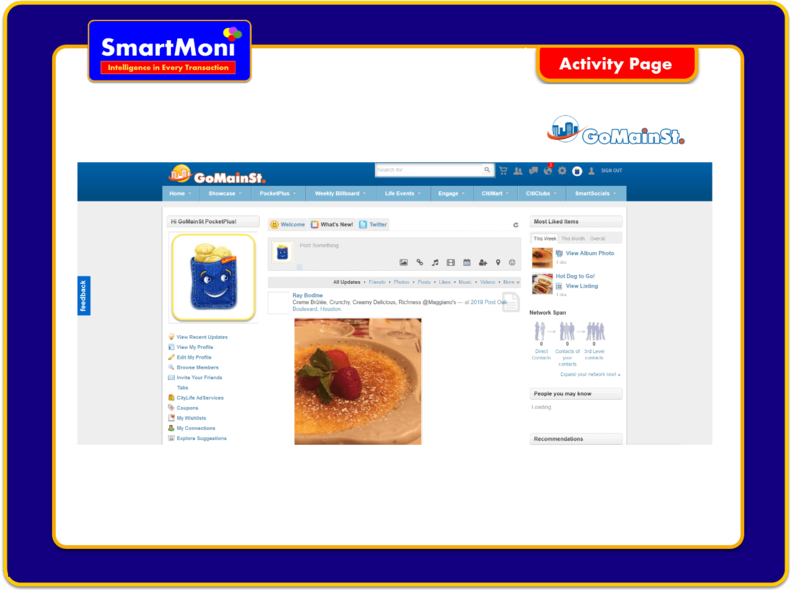 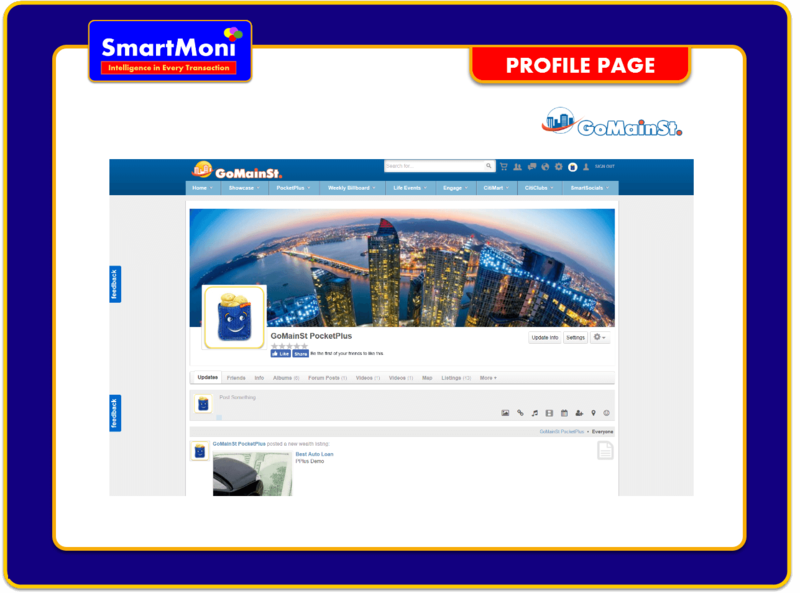 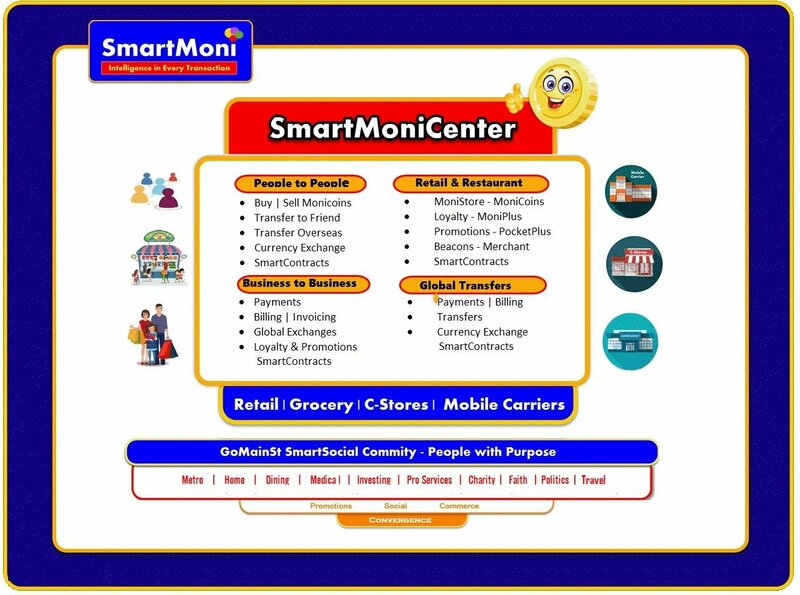 SmartMoniCenters provide service coast to coast from people who use Moni the most and are best able to service it. 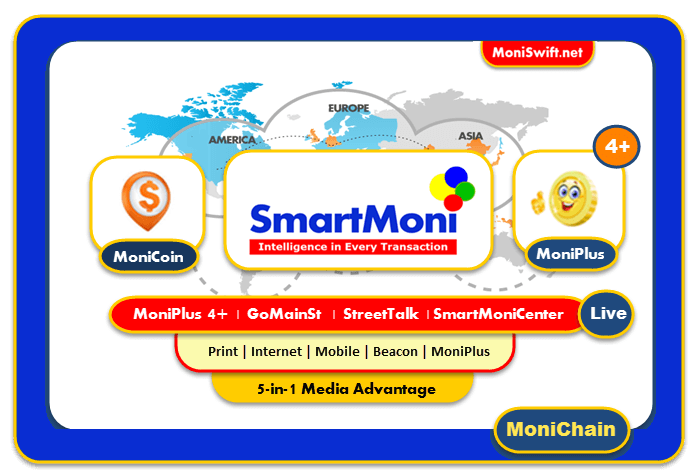 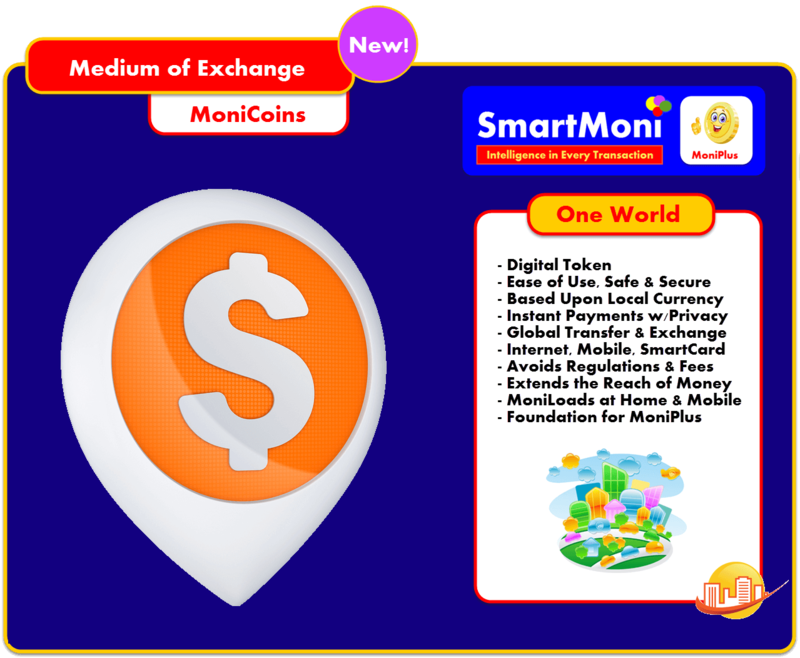 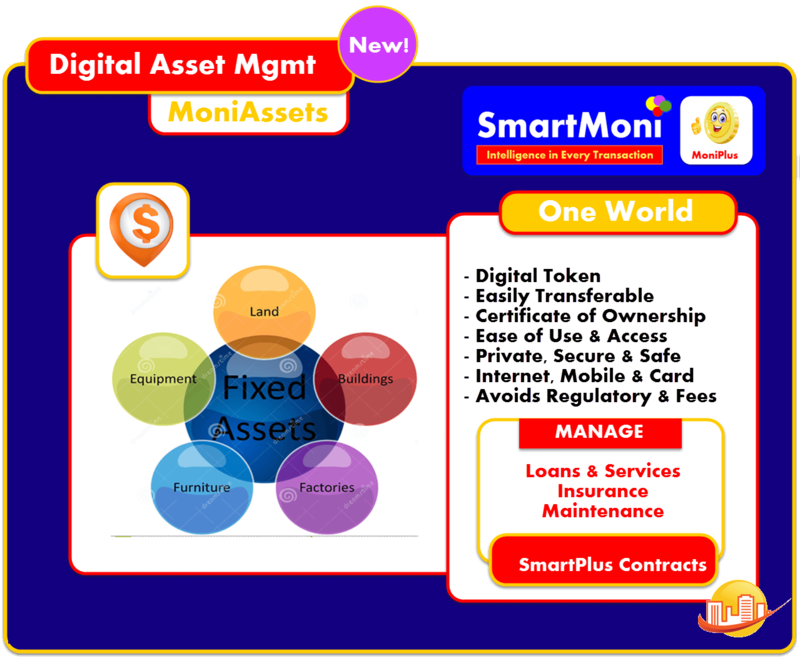 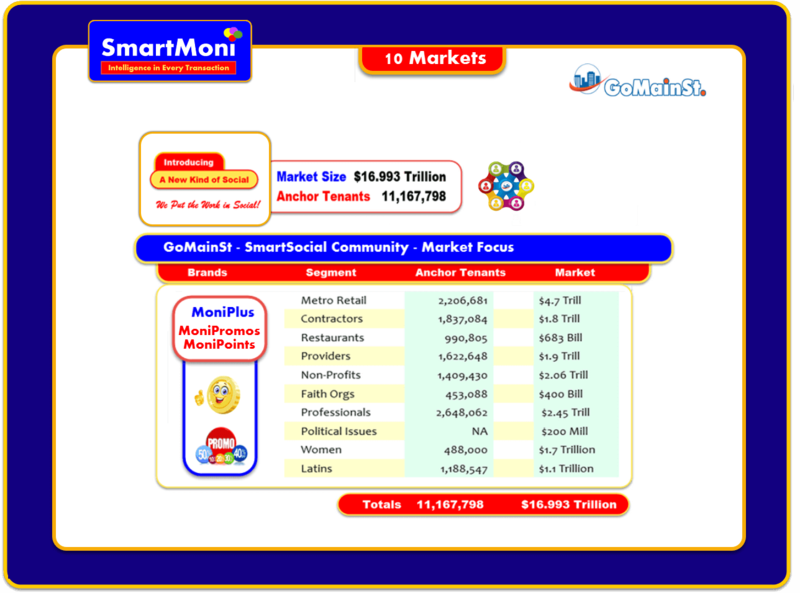 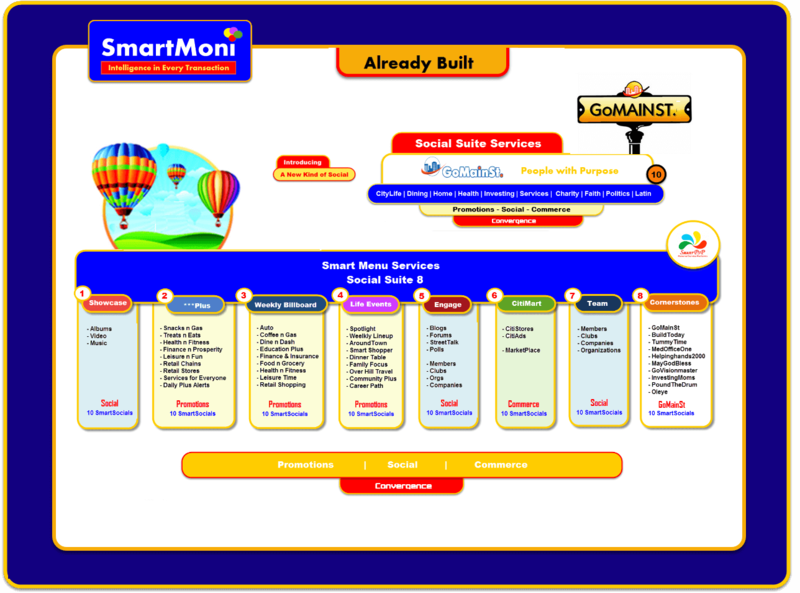 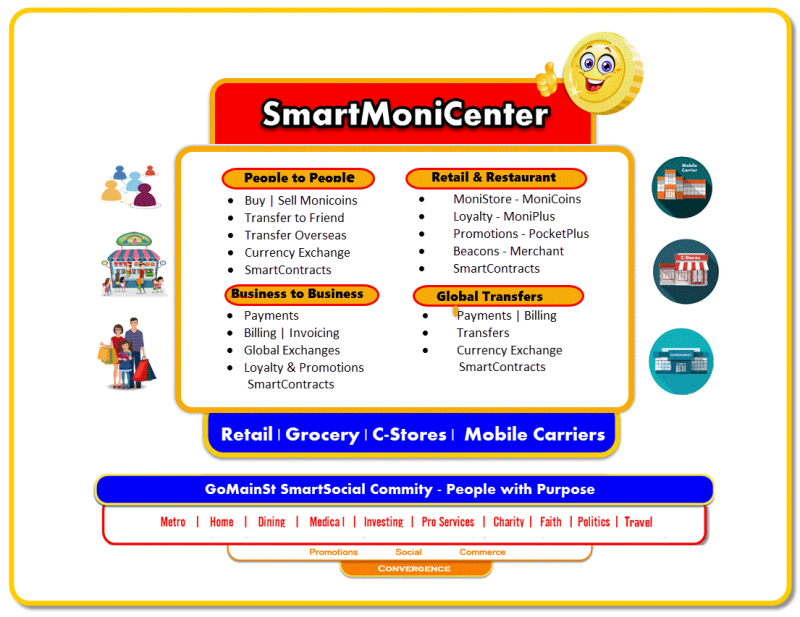 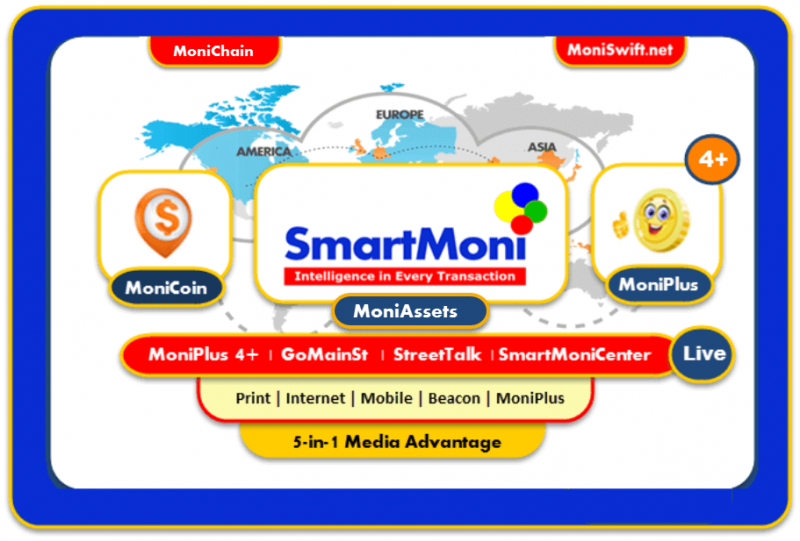 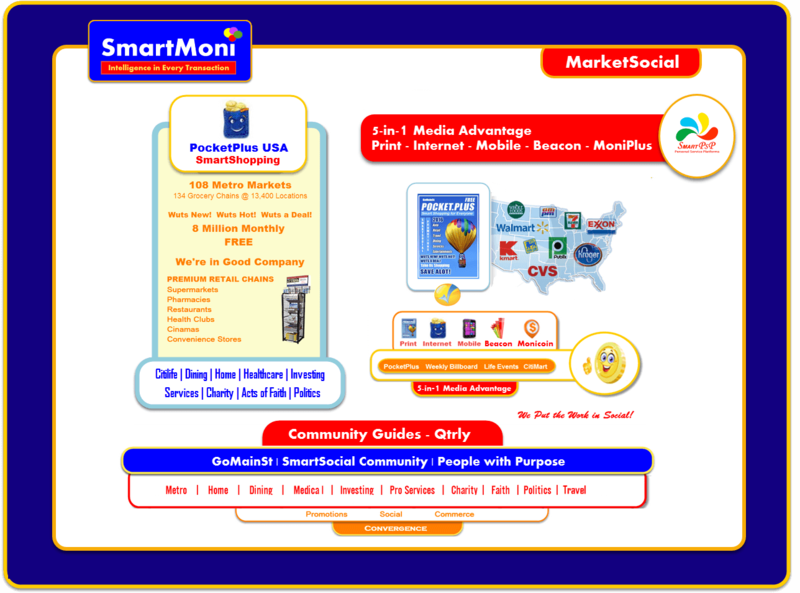 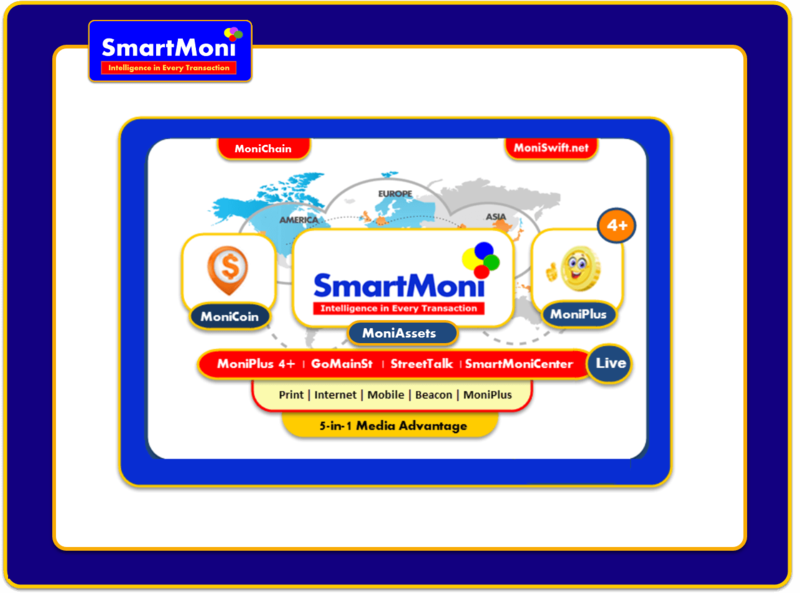 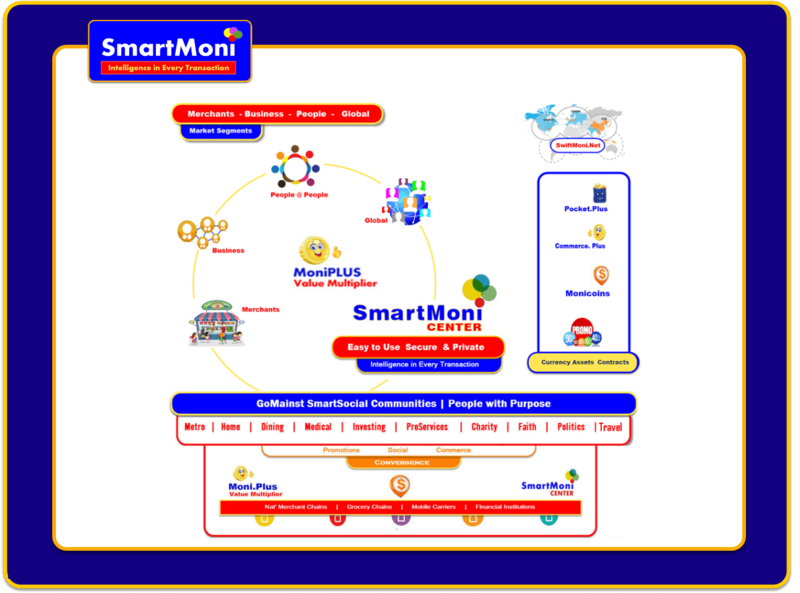 Fast & Convenient SmartMoni w/MoniPlus - MoniPlus Wallet - MoniPlus Pay Internet - GoMainSt MarketSocial PocketPlus - StreetTalk SocialStream - SmartMoniCenters Convergence of the Data Stream"
Win the Marketplace SmartMoni w/MoniPlus. 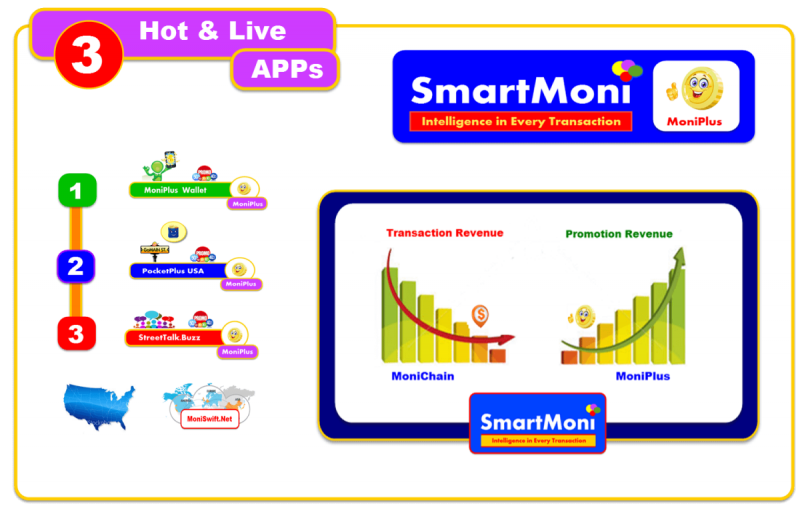 We provide next generation capabilities with We increase the value of every transaction with MoniPlus 6+ - Points, Rewards, Incentives & Promotions. 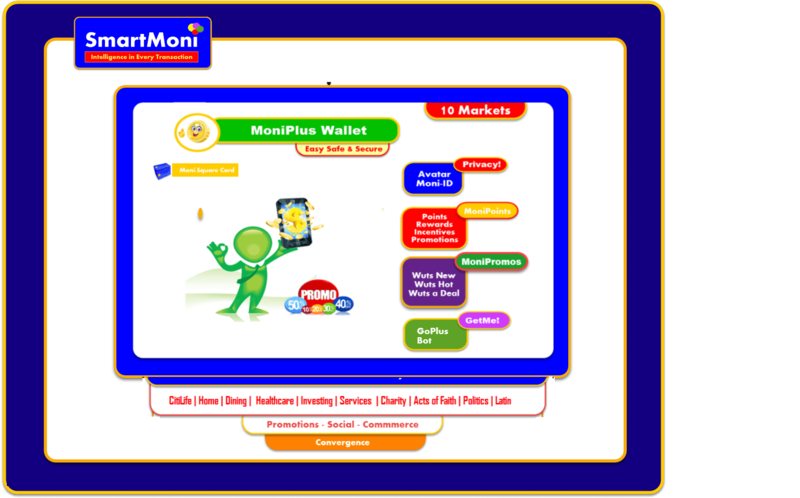 There are 100s of Bitcoin Wallets and Coins, which one is popular? 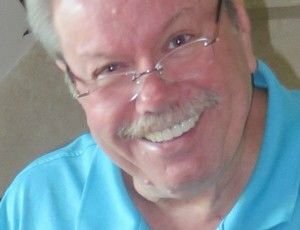 Not one, because they did nothing to bring them to market and service them. 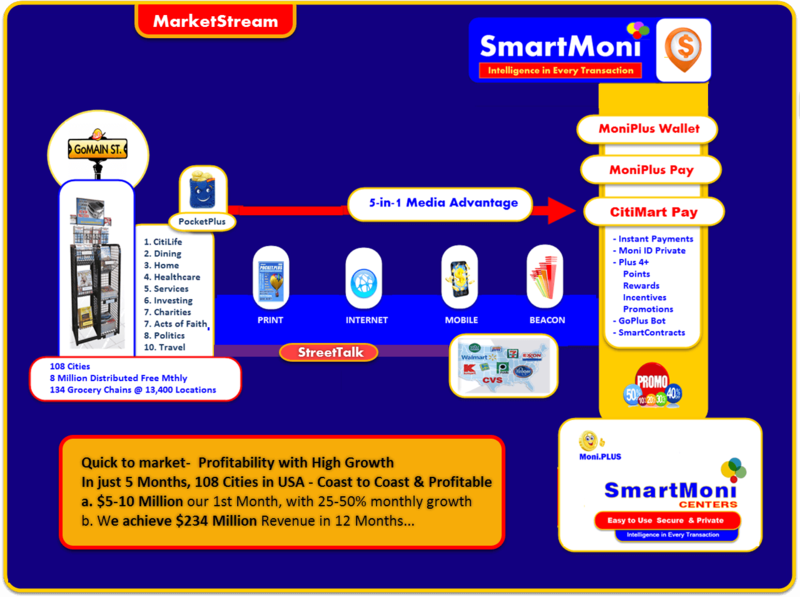 The one who succeeds, grabs market share then surges ahead. 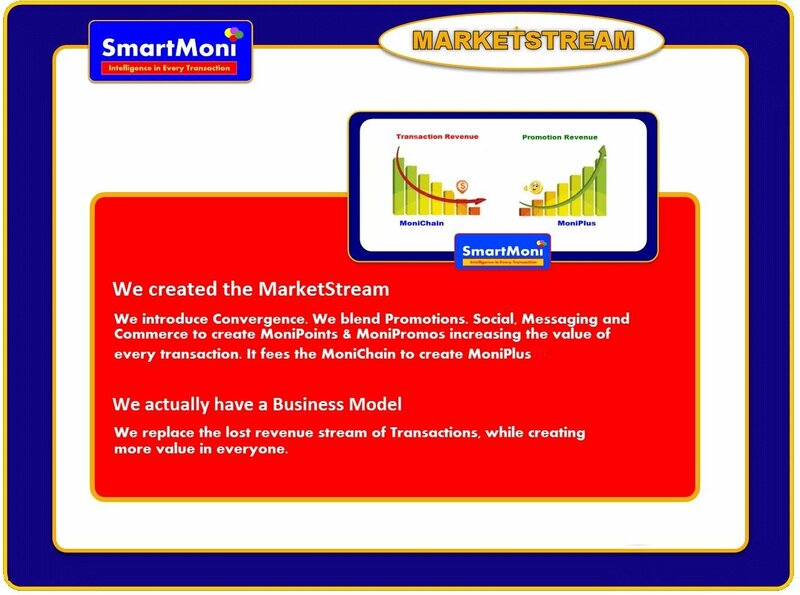 We have the solution and to ensure we achieve market dominance. 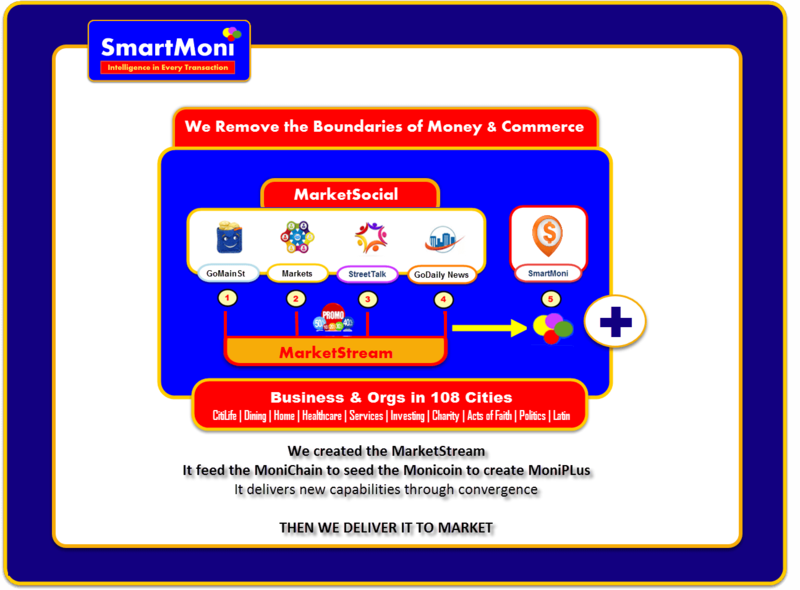 We launch 2 Powerful & New MarketSocial platforms in 108 Cities focusing on 10 Broad Market Segments. 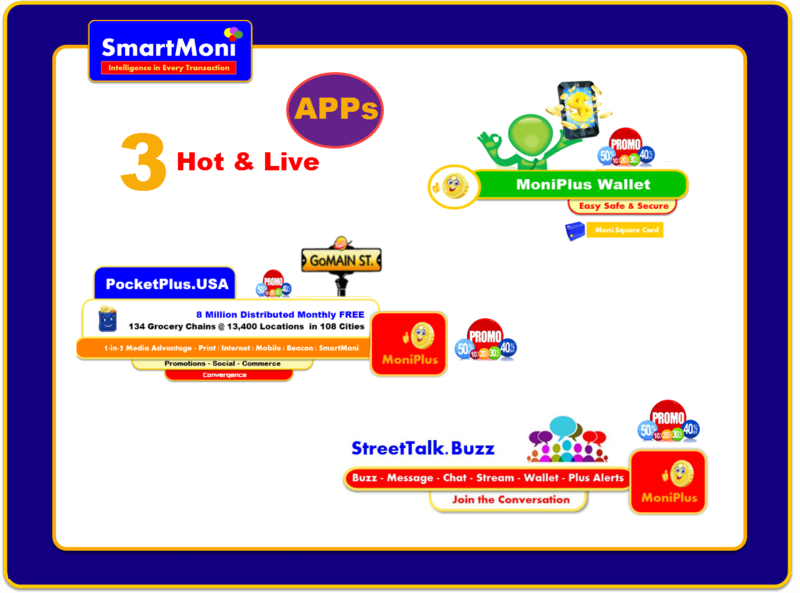 GoMainSt w/PocketPlus USA and StreetTalk - BOTH w/MoniPlus 6+ Convergence blends Promotions | Social | Commerce w/MoniPlus Instant Payments, Privacy, GoPlus Valet "Find Me" Service w/MoniPlus 6+ Loyalty, Rewards, Incentives & Promotions Prosperity on Demand"
Live On Demand I have 129 Apps in my SmartPhone. 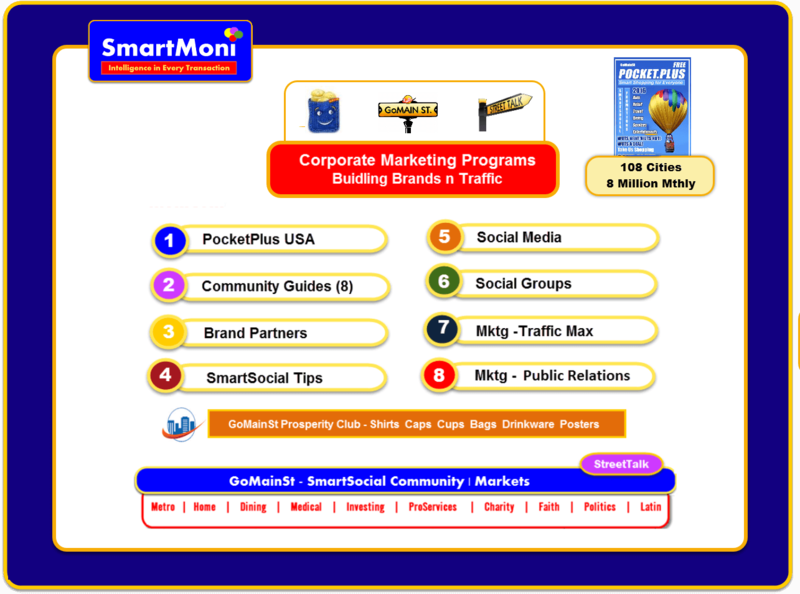 Only 6 are “Live”, 4 are messenger apps and two are Facebook and LinkedIn. 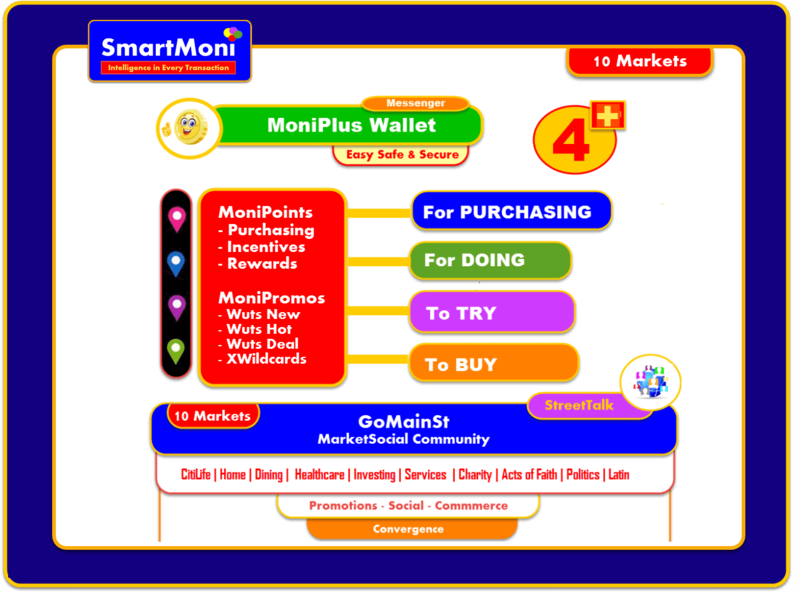 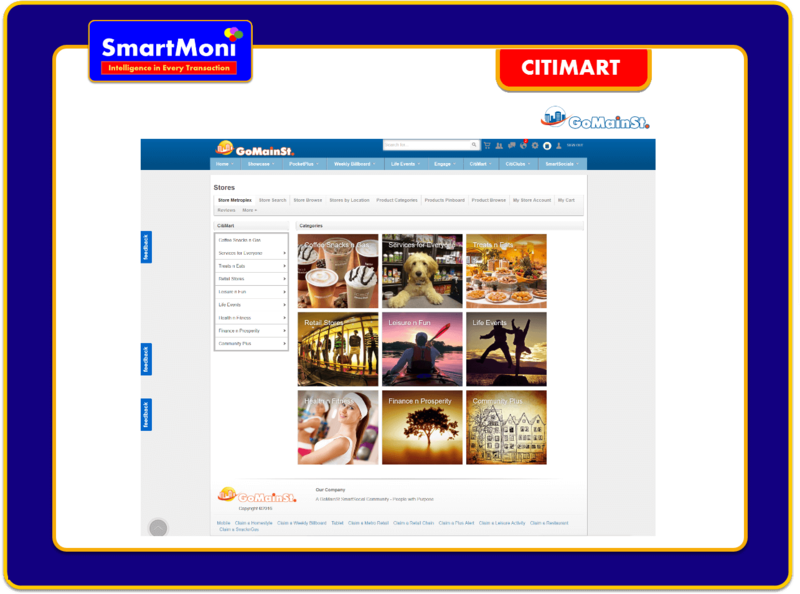 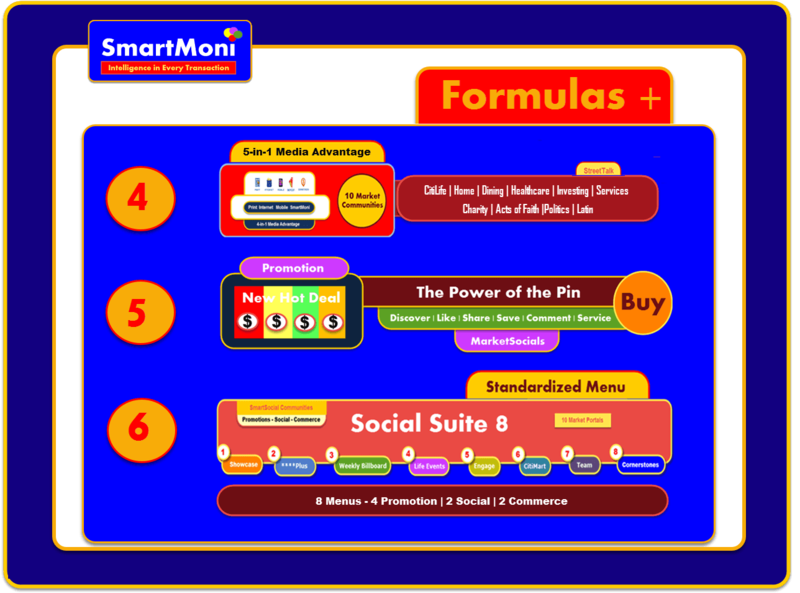 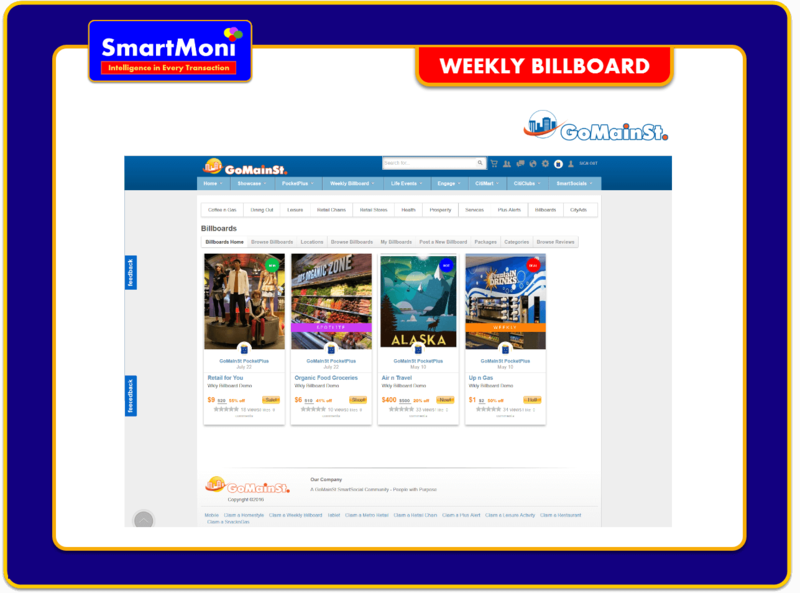 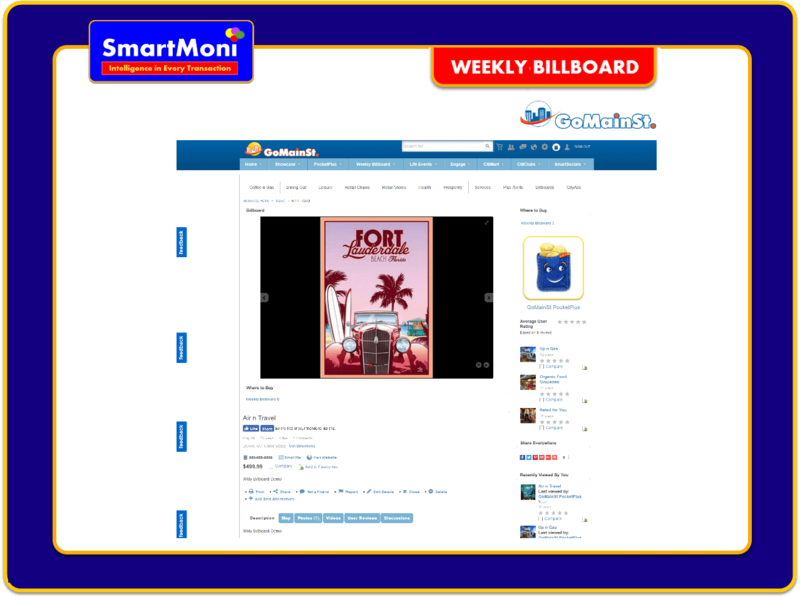 SmartMoni is designed to be Must-Be-Live at Your Side It will provide a Promotions-on-Demand for 11 Markets, A Valet "Get Me" Service, Messenger and MoniPlus 6 Wallet with Points Rewards Incentives & Promotions for every purchase. 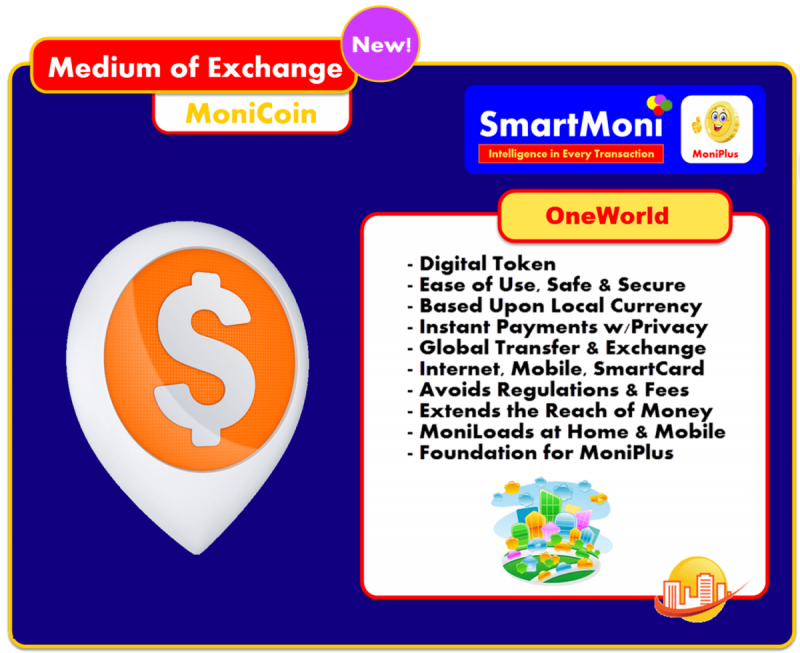 On Demand Purchase Plus 6 Pack Instant Payments | Messenger | Privacy | Valet Service | MoniPlus + | 11 Markets Increased purchasing power with every transaction while building better Relationships & Community. 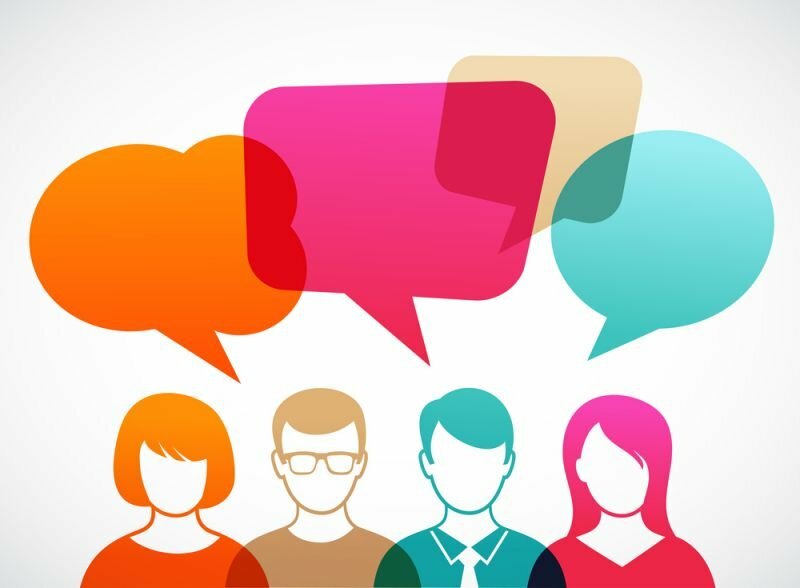 At Your Fingertips"
People with Purpose StreetTalk is an opportunity for People Products Services & Places to find better solutions and build stronger communities. 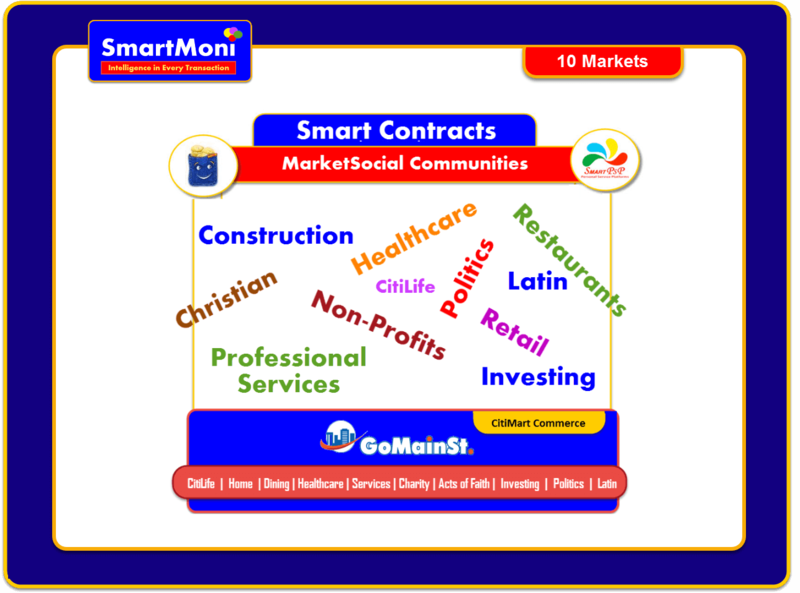 We deliver SocialStream with Buzz, Messenger, Chat, Live-n-Post with a Metro View and 11 Market Segments: EveryWon - People Professionals Teams Companies Organizations Markets: CitiLife, Dining, Home, Healthcare, Services, Investing, Charity, Acts of Faith, Politics, Travel and Latin Life. 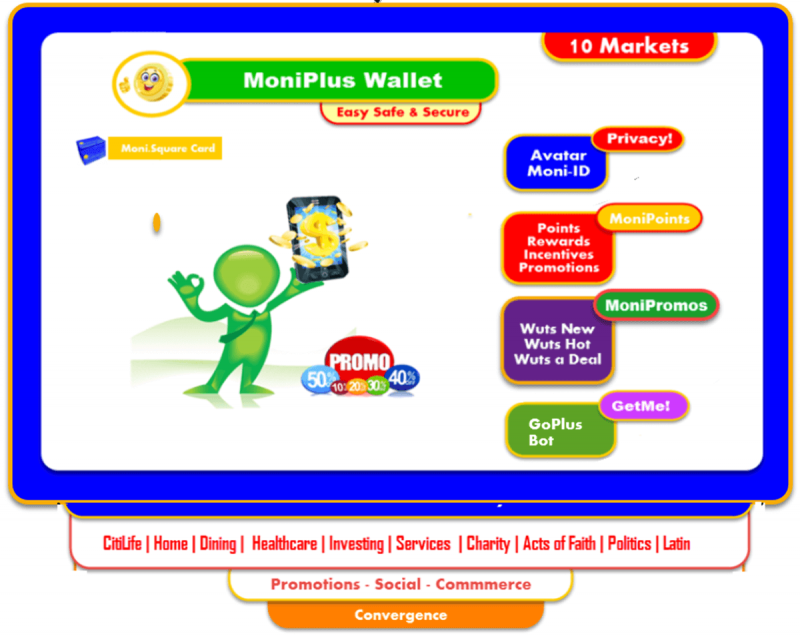 Buzz Chat Messenger Video Blog MoniPlus Wallet w/Points Rewards Incentives & Promotions The New SocialStream Engage & Prosper"
Sea to Shining Sea In 5 months, GoMainSt MarketSocial – w/PocketPlus USA will roll out in 108 Cities with Nat'l Restaurant, Retail and Service Chains in 134 Grocery Chains at 13,400 locations. 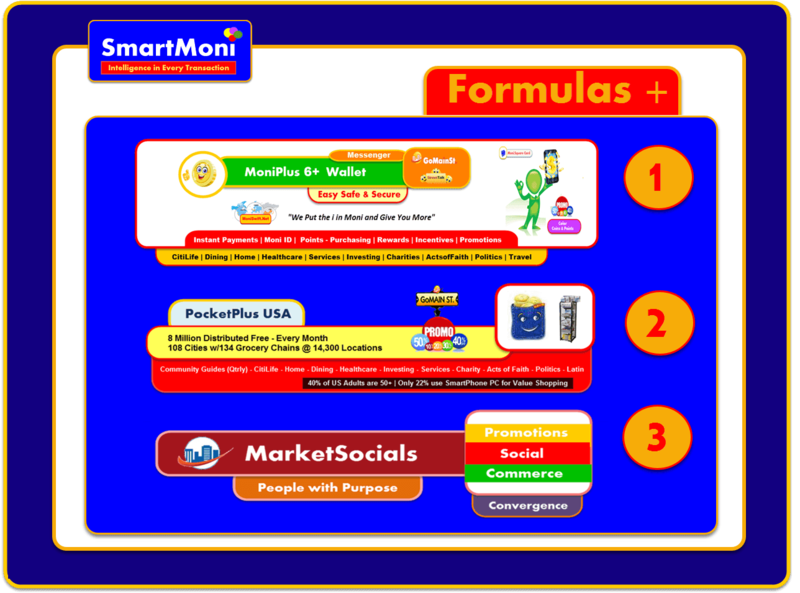 We achieve USA Brand prominence, a positive cash flow with high growth rate and the harvesting just begins for 11 Market Segments in 108 Cities Formula for Success - Lowers Metro Ad Costs by 80% - The Next Social: MarketSocial - Convergence of the Data Stream Promos Social Commerce - PocketPlus 5X to grow your Business - 5-in-1 Media Advantage - Pin Power Commerce - Global MoniSwift.Net | M2M 1st Year $234 Million"